No. 4 Commando after a raid on France, April 1942. The unit's first operation was the successful raid on the Lofoten Islands on 4 March 1941. The next two planned operations were both cancelled and it was not until 22 April 1942 that No. 4 Commando took part in another raid, Operation Abercrombie, a raid on the French coastal town of Hardelot. On 22 August 1942, No. 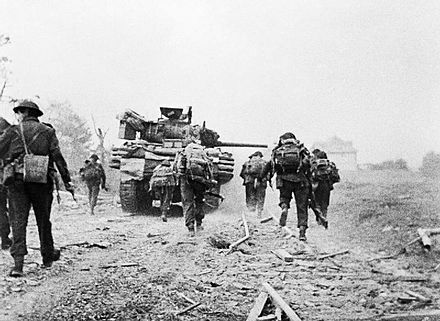 4 was one of three commando units selected for the Dieppe raid. Under the command of Lord Lovat, No. 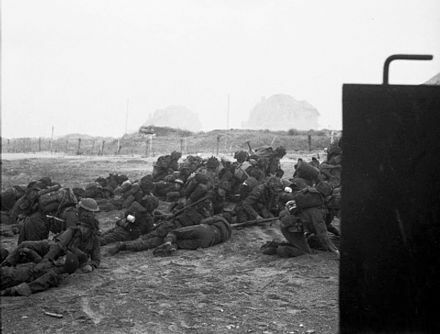 4 Commando landed on the right flank of the main landings and successfully silenced a German gun battery. This was the only complete success of the operation, which was eventually aborted, after less than 10 hours, following heavy losses. As part of the 1st Special Service Brigade, No. 4 Commando took part in the Normandy Landings in June 1944. 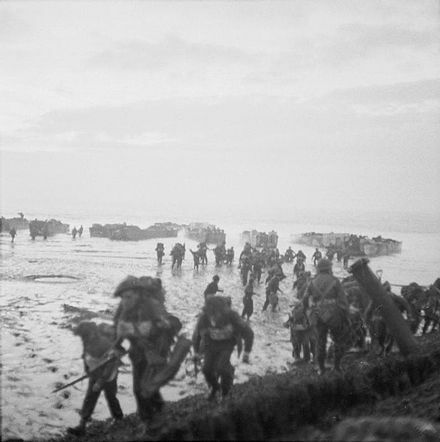 Landing on Sword beach 30 minutes before the rest of the brigade, their first objectives were to capture a strong point and gun battery in Ouistreham. 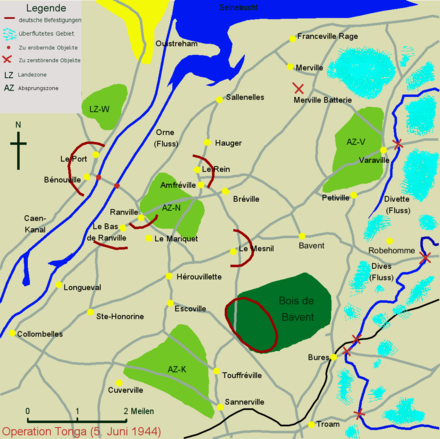 After the commandos eliminated these positions they rejoined the brigade, reinforcing the 6th Airborne Division at the Orne bridges. Before the invasion the brigade had been informed that they would stay in France for only a few days. The commando remained there for a further 82 days, protecting the beachhead's left flank. During that period, No. 4 Commando endured over 50 percent casualties. Finally withdrawn to Britain in September 1944, they were reassigned to the 4th Special Service Brigade for the assault on Walcheren island. At the end of the war No. 4 Commando became part of the occupation force in Germany, but together with all other army commando units were disbanded in 1946. 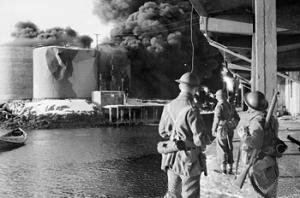 Commandos watching the fish oil tanks burn. On 20 February 1941, No. 4 Commando were informed they would be going to Troon in Scotland for an exercise. The next day the unit boarded HMS Queen Emma, but on 22 February 1941, after they anchored at Scapa Flow, their real objective was divulged. Together with No. 3 Commando they were to conduct Operation Claymore, a raid on the Lofoten Islands. Claymore's main objective was to stop the manufacture of fish oil and its exportation to Germany, where it was used in making explosives. Major Lord Lovat, giving orders before setting out on Operation Abercrombie 21 April 1942. 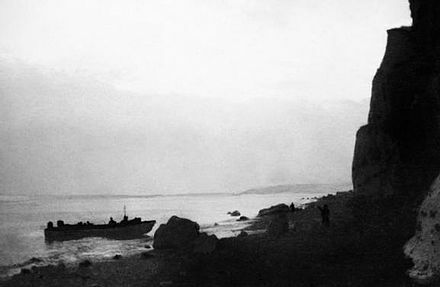 Landing craft of No 4 Commando running in to land at Orange one beach, on the right flank of the main assault at Dieppe. Brigadier Lord Lovat, in command of the 1st Special Service Brigade, issued orders for the brigade's forthcoming role in the landings. The Intention. The 6th Airborne Division and 1st Special Service Brigade would be responsible for holding the left flank of the Allied bridgehead of the invasion of Normandy. A film still showing men of No. 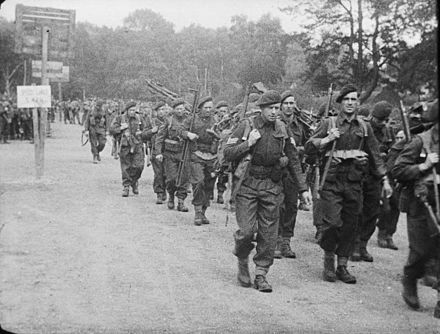 4 Commando, 1st Special Service Brigade, marching from their assembly camp to Southampton for embarkation to Normandy, June 1944. Dead and wounded infantry on Sword Beach, on the morning of 6 June 1944. Sherman Duplex Drive tank of 'B' Squadron, 13th/18th Royal Hussars, and No. 4 Commando advancing towards Ouistreham. Walcheren showing the locations of the German gun batteries, the main towns and the Canadian units involved. ↑ "No. 38331". The London Gazette (Supplement). 22 June 1948. p. 3688. ↑ Thompson, Julian. "The Dieppe Raid." BBC, 6 June 2010. ↑ "No. 35729". The London Gazette (Supplement). 2 October 1942. p. 4323. ↑ "No. 35729". The London Gazette (Supplement). 2 October 1942. p. 4328. 1 2 Ford 2009 , pp. 213.238.
van der Bijl, Nick (2006). No. 10 Inter-Allied Commando 1942–45. Oxford: Osprey Publishing. ISBN 1-84176-999-1. Bradham, Randolph (2003). Hitler's U-boat Fortresses. Santa Barbara, CA: Greenwood Publishing Group. ISBN 0-275-98133-9. Chappell, Mike (1996). Army Commandos 1940–1945. Elite Series # 64. Oxford: Osprey Publishing. ISBN 1-85532-579-9. Dunning, James (2003). The Fighting Fourth, No. 4 Commando at War 1940–45. Stroud, Gloucestershire: Sutton Publishing. ISBN 0-7509-3095-0. Ford, Ken (2003). Dieppe 1942. Campaign # 127. Botley, Oxford: Osprey Publishing. ISBN 1-84176-624-0. Ford, Ken (2002). D-Day 1944: Sword Beach & British Airborne Landings. Oxford: Osprey Publishing. ISBN 1-84176-366-7. Ford, Ken; Zaloga, Steven, J; Badsey, Spethen (2009). Overlord: The D-Day Landings. Oxford: Osprey Publishing. ISBN 1-84603-424-8. Griffin, P.D (2006). Encyclopedia of Modern British Army Regiments. Stroud, Gloucestershire: Sutton Publishing. ISBN 0-7509-3929-X. Harclerode; Renolds, David (2001). Commando. Stroud, Gloucestershire: Sutton Publishing. ISBN 0-7509-3164-7. Haskew, Michael E (2007). Encyclopaedia of Elite Forces in the Second World War. Barnsley, Yorks: Pen and Sword. ISBN 978-1-84415-577-4. Joslen, H. F. (1990). Orders of Battle, Second World War, 1939–1945. London: Naval & Military Press. ISBN 1-84342-474-6. Moreman, Tim (2006). British Commandos 1940–46. Oxford: Osprey Publishing. ISBN 978-1-84176-986-8.